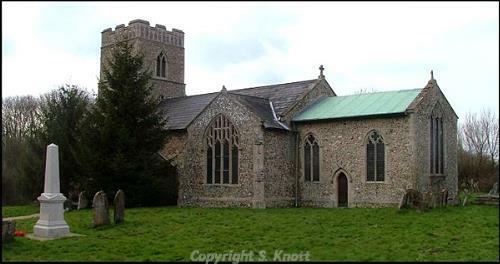 The parish of Wendling is situated in the Brecklands District of Norfolk. It lies north of Scarning, east of Fransham, south of Longham and west of Gressenhall. The name Wendling may derive from the Old English meaning ‘place of Wendel’s people’. The parish has a long history and was established by the time of the Norman Conquest. Its population, land ownership and productive resources were detailed in the Domesday Book of 1086. This document revealed that the parish lands were part of the Abbot of St Edmunds holdings and that Wendling possessed a mill, woodland and numerous pigs. The earliest evidence of human occupation in the parish is provided by scatters of flint pot boilers (NHER 7285 and 30216). These burnt flints date to the prehistoric period, and a number of contemporary flint tools have also been found in Wendling. Of these tools (e.g. NHER 28461 and 28462), several have been identified as scrapers (NHER 39638 and 39640); a common find from this era. More definitively dated stone tools have been recorded, and these comprise a Mesolithic flaked axehead (NHER 18383) and perforated stone object (NHER 28376) along with a Neolithic axehead (NHER 11618). Only a couple of finds from the Bronze Age have been reported in Wendling. One is a copper alloy palstave (NHER 11130) whilst the other is a stone axe-hammer (NHER 7278). Similarly, few finds have been dated to the Iron Age period. Sherds of pottery (NHER 28463) and a toggle (NHER 40868) are amongst the only finds on record. However, the Launditch earthwork (NHER 7235) may be of Iron Age date (although it could also be a Saxon feature). This earthwork extends for 0.9km and would once have been part of a larger defensive system. Only a limited variety of Roman objects have been found in Wendling. The majority of finds consist of coins (NHER 28461 and 30215) and pottery sherds (NHER 7280 and 15016). However, more interesting finds include a Dolphin brooch (NHER 40868) and pieces of casting waste (NHER 35353) which may show the production of metal objects. It is also worth noting that a Roman road (NHER 2796) intersects the Launditch earthwork (NHER 7235), although the presence of this road doesn’t aid the dating of this earthwork feature. Metal detecting across the parish has recovered a number of pieces of Saxon metalwork. Most of these objects date to the latter part of the period and include a stirrup strap mount (NHER 30215), strap end (NHER 28463), harness cheek-piece (NHER 30215) and part of a trefoil brooch (NHER 35105). However, a single Early Saxon wrist clasp (NHER 35105) has also been retrieved and represents one of the few earlier Saxon finds in Wendling. The most obvious medieval monument in Wendling is the parish church of St Peter and St Paul (NHER 7296). The earliest features of this church are Norman in date and include an impressive carved stone head set above the south doorway. The chancel is in the Decorated style but the nave is in the Perpendicular style, although some of the windows do retain Decorated features. The Perpendicular tower has flint flushwork and has several gargoyles. In addition, medieval Wendling was home to a Premonstratensian Priory during 1267-1537. The foundations and earthworks of this monastic complex (NHER 7281) survive and the priory site has been carefully managed since 2000. There were several settlement foci during the medieval period in Wendling. A small hamlet (NHER 30217) existed to the northeast of Lower Farm (NHER 29820) and images from the Cambridge University Collection of Aerial Photographs suggest a deserted medieval settlement (NHER 21754). Aerial photography has also served to identify a couple of medieval tofts (NHER 13099 and 28464) in the parish. No medieval manor houses have been identified but a curved moat (NHER 7291) was noted near to Manor House (NHER 11616). However, it is unclear whether this feature is a medieval moat or not, as the Ordnance Survey records it as a drainage channel. It has also been speculated that Honeypot Wood (NHER 49112) is ancient woodland dating back to the medieval period. If this is the case then it is possible that Honeypot Wood is the one mentioned in the Domesday Book. The medieval period is well represented by small finds. The most intriguing find is an odd lead ampulla (NHER 35105), which may have related to the Priory. Other more interesting artefacts comprise a coin brooch (NHER 35105), an ansate brooch (NHER 41109) and several hones (NHER 40868). More mundane items to be recovered in Wendling include an iron spearhead (NHER 7284), a horse harness pendant (NHER 30215) and assorted strap ends (NHER 34189). During the post medieval period several fine buildings were constructed in Wendling. First and foremost of these is Manor House (NHER 11616) built from white brick during the 18th-19th century. It is notable for its Classical porch and survives in an excellent condition. The Grange (NHER 11617) is also of interest, as the massive flint foundations the building stands on may relate to a medieval monastic grange. Numerous medieval stone fragments from Wendling Priory have also been found in the garden of this 17th century house. Lastly Honey Pot Farm (NHER 14856) is worth a look, as this 17th-19th century timber-framed barn makes use of older timbers. The fact that the 1836 Ordnance Survey map of Wendling marks this as the site of a hall may suggest this was once a manorial site. The archaeological records give few clues to the trades and industries present in the parish during this era. Faden’s map of 1797 also shows that the village possessed a mill (NHER 15161) by this time. Further research shows that this post mill was replaced by a tower mill in 1853-60 and last used in 1878. The Lynn and Dereham Railway (NHER 13600) ran through the parish before 1846, and Wendling was important enough to warrant its own station. However, it is impossible to tell whether this new transport aided the trade of local businesses. A brief mention should be made of the post medieval objects from Wendling. All these items relate to everyday life and a representative selection could include book clasps (NHER 28463), spurs (NHER 34189), a knife handle (NHER 35353), cloth seals (NHER 40867) and an animal bell (NHER 41336). Perhaps the most unusual find from this era is part of a lead trough that was probably used to feed chickens (NHER 42701). The most recent archaeological records for the parish relate to World War Two sites. During the war, Wendling Airfield (NHER 7275) was used by the 118th Division of the United States Army Air Force. Some of the main runways and building remain, and some of these buildings contain wartime wall paintings. A World War Two bomb store (NHER 35925) associated with this airfield also survives, and the earthworks of this store extend into Honeypot Wood to the north. Thomas Sunley (NLA) 13 August 2007.